Wet 'n' Wild Perfect Pair Lip Wand is dual-ended lipstick pen that contains a matching lipstick and a lip liner. It promises to deliver precise application (via lip liner) and provide intense pigmentation to color the lips (via lipstick). The lipstick gives high shine that eliminates the need to use more lip products. 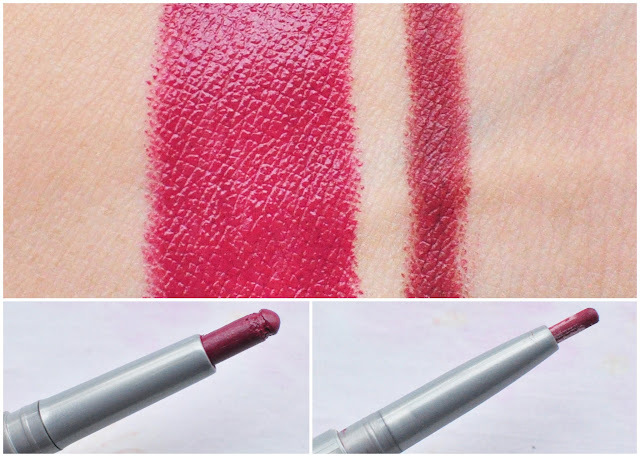 Passion Plum became a favorite because it was near dupe to one of my most coveted lip color, MAC Rebel. But MAC Rebel tends to turn red to hot pink after awhile, Passion Plum leans more on the darker plum red shade. I would say that this one is a good bet if you're leaning towards the villain or kontrobida look. I never really imagined myself wearing shades as dark as these much less think of actually buying one. But here I actually searched quite a while for a flattering purple-base kontrabida lipstick for myself. And although it isn't fall season, I find that lipstick like this seems to be timeless shade. Passion Plum definitely makes a statement. I recommend contouring your face to provide more dimension since the lip color would make your face look when worn alone. Contouring and proper placement of the blush also adds more life to the face, making you look more approachable. Try not to go heavy on the eye liner on the lower lashline but just give enough on the upper ones. For the evening, you can opt to go on a sultry look by deepening the the crease or doing smokey eyes. I would suggest a darker plum or a prime looks of browns and blacks. I'm quite happy that I finally found a very flattering deep plum shade that I've always wanted. I seriously thought it's going to be easy but it really wasn't. Many of the available brands in the department stores I've been to barely carry shades as intense and as adventurous as this. The only ones I've seen were Revlon and L.A. Colors. So if you happen to pass by a Wet 'n' Wild counter and you see this, better pick it up. You'll never when a shade like this will come in handy. Are you as fascinated as I am with rich dark lip colors? I love the color! It's so pretty! Good thing there's a Wet 'n' Wild counter in the department store near us. I'll ask the same question as prettythrifty. I wonder how much this is? It looks wow! I've been obsessed with rich, dark colours I think since high school. I remember making kupit my Mum's wine Clarins lipstick and putting my trusty Penshoppe gloss in brandy over it. Now, most of my lipsticks are very richly coloured. Very kontrabida, like you say. In fact, my friend told me na every time she sees a tube of NYX's Black Cherry round lippie, ako ang naiisip niya! LOL! REally pretty shade and suits you well. Even though the weather is getting warmer, dark lips is suddenly trendy here. I like Wet n' Wild, reminds me of my high school days.